Nintendo – perhaps unlike any other games company – understands the connection between video gaming and the physical world. That might sound like a rather silly statement to make as every firm involved in the making of interactive entertainment has to consider how the player will interact physically with the game itself, but with Nintendo, it feels like there's this extra layer of comprehension; a result, perhaps, of the company's origins as a creator of toys and games long before Mario and company came along. Whether it's the gloriously tactile nature of the classic Game Boy handheld or the immersive qualities of peripherals like the iconic Donkey Konga Bongos, Nintendo has always embraced every opportunity to link its players with its software in new and lucrative ways (amiibo, we're looking at you) and the Pokémon series is no exception. The original Game Boy games resurrected the ageing monochrome handheld and finally gave people a reason to crack out those long-forgotten link cables, while later on, Nintendo would come up with the even more compact Pokémon Mini and the Pokéwalker accessory. 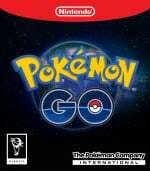 The natural evolution of the latter was, of course, the Pokémon GO Plus, a companion device for the smartphone game which allowed players to catch monsters, spin Pokéstops and contribute to their distance totals in the game itself without having to remove their phone from the safety of their pocket. Nintendo has returned to this concept with a new accessory, and it's perhaps the most perfect realisation of any Pokémon-based device the company has ever produced. 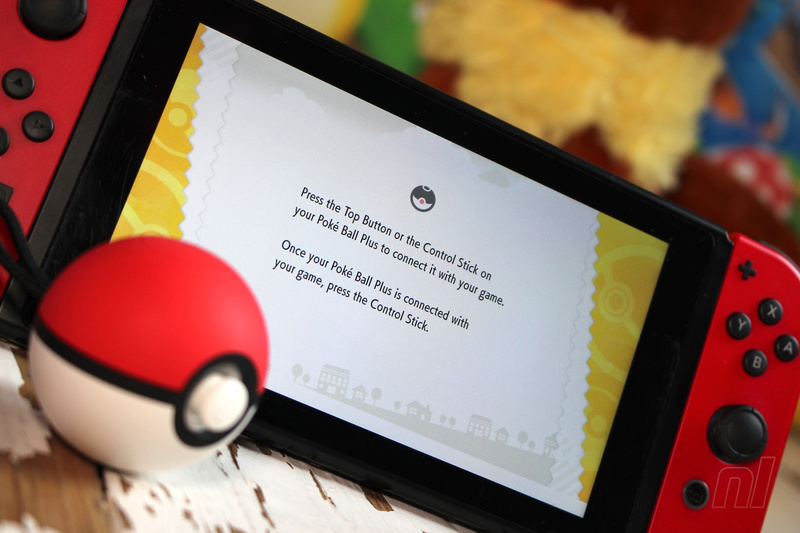 The Poké Ball Plus really does make you feel like a trainer; not only can it be used to control Pokémon Let's Go on Switch – complete with a throwing motion to hurl Poké Balls in the virtual world – it can also act like a standard Pokémon GO Plus for use with the mobile game. 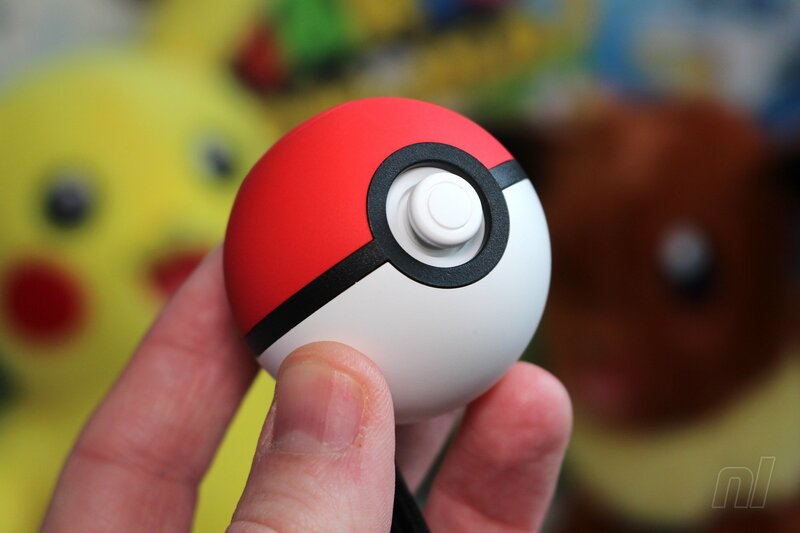 In terms of design, the Poké Ball Plus is a dead ringer for the real thing, and will surely fulfil all those dreams you had of becoming Ash Ketchum when you were a kid. The outer casing is made from a kind of soft-touch plastic, so while it's sturdy enough to withstand punishment, it feels grippy in the hand. Outside of the status LED and internal speaker, there are two physical inputs – the analog stick (which can be clicked down for your 'A' button command) and a button on the top which acts as 'B'. With these elements, you can fully control Pokémon Let's Go, although some quick-menu commands won't be accessible due to the lack of the X and Y buttons, so you'll need to spend a little more time navigating menus to accomplish some tasks. For the most part, controlling the game exclusively using the Poké Ball Plus is perfectly agreeable; the stick is stubby but precise and the B button is easy to press, as long as you're holding the device exactly the right way (the red section of the ball should always be facing upwards). Problems occur when pressing the analog stick down to accept on-screen prompts and make selections; it's too easy to accidentally push a direction when pushing down and therefore pick the wrong option. With careful use and a spot of willpower you can overcome this problem, but it's still irksome all the same. The second issue relates to what should be the Poké Ball Plus' key selling point – its motion-sensing ability which allows you to mimic the famous throwing action seen in the games, TV show and movies. When you face off against a monster in the game, you're presented with a screen not entirely dissimilar to the one seen in Pokémon GO; a constantly shrinking ring is shown over the 'mon, with its colour denoting the difficulty of the upcoming capture attempt (green is easy, red is hard – you know the drill). The objective is to get your ball inside the ring, with a bonus being dished out if the ring is at its smallest point. To do this, you have to perform a throwing gesture with the Poké Ball Plus (which of course explains why the unit comes with a strap that not only attaches to your wrist but also to your finger as well), a move which is initially jolly good fun but soon becomes too much like trial and error for comfort. There's often a delay between your motion and the game responding, which isn't ideal when you're trying to get a perfect shot. The other problem is that the device isn't totally accurate, and there are times when a straight-arm hurl turns into a sideways curler, and vice versa. To be fair, criticisms of this gesture-based system can also be levelled at the Joy-Con, which is utilised in a similar fashion. What makes the Poké Ball Plus less enjoyable to use is the fact that, as a round object, it doesn't give the user an easy indication of which way is 'up' and this can make directing your throws harder than it should to be. With the Joy-Con, it's immediately obvious which way is up and you can adjust your gesture accordingly to ensnare 'mon which are moving around the screen; even then, it's hardly an exact science and this is what led us to conclude in our review that playing in handheld mode with the Joy-Con attached to the console is the best way to experience the game. The Poké Ball Plus does have a few more tricks up its sleeve, however; buying one is the only way of unlocking Mew in the game (the monster is 'trapped' within the ball and has to be transferred to the main game – a neat touch) and you can also take one of your captured monsters for a stroll with you and unlock rewards such as experience points and bonus candy. When you're out and about, a long-press on the A button will cause the Poké Ball Plus' LED to turn yellow, and shaking the device will trigger a sound clip of the Pokémon contained within. The force-feedback motor also gives a rumble, which will convince younger players than there really is a wee beast caged within. 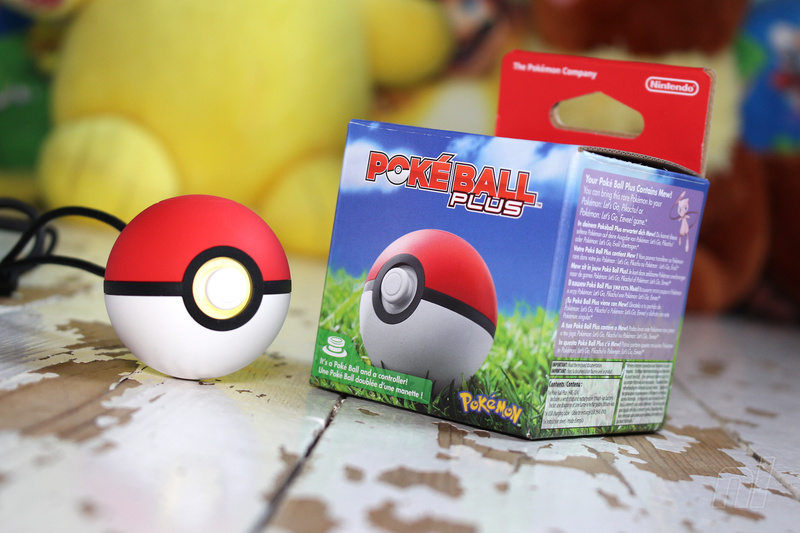 The Poké Ball Plus' internal battery lasts about as long as the one contained inside a Joy-Con, although you may find it drains faster if you choose to use it as a Pokémon GO Plus and take it out of the house with you on a daily basis. The unit is charged via a USB Type-C connection; a flap lifts up to reveal the port and thankfully a cable has been included in the box. 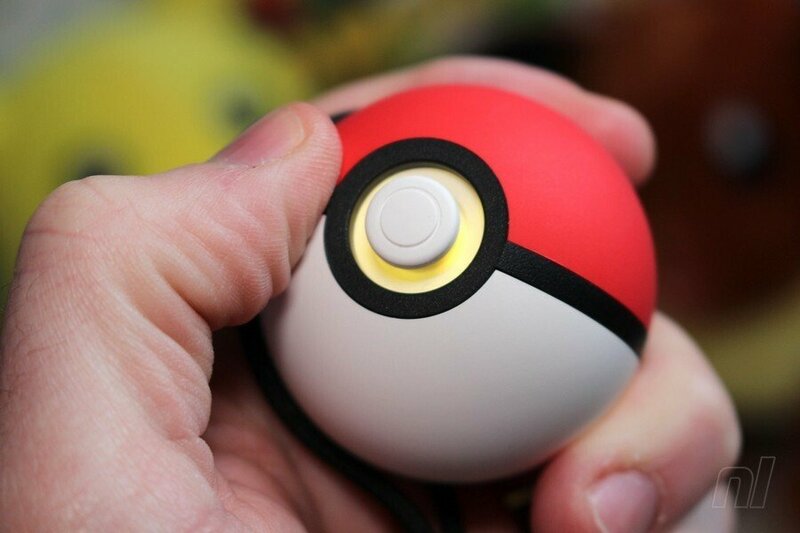 In so many ways, the Poké Ball Plus is the perfect accessory for Pokémon fans. 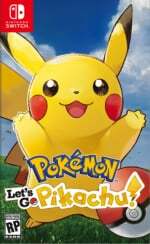 It looks the part, makes you feel like a real trainer and hides plenty of cool secrets – triggering the cry of the Pokémon contained inside is a surefire way of bringing a smile to someone's face – but the fact remains that it presents possibly the least enjoyable means of interacting with Pokémon Let's Go currently available. Handheld mode – which uses both Joy-Con and allows you to aim and throw using a combination of gyro controls and physical buttons – is far superior, and even a single Joy-Con feels more precise than this. What saves the Poké Ball Plus from being a complete write-off is the fact that it can interact with Pokémon GO and it offers a means of earning in-game rewards even when you're not playing – oh, and getting access to Mew from day one is a nice bonus, of course, but locking this legendary 'mon behind a £45 paywall is perhaps a bit mean-spirited of Nintendo. As such, this is one accessory which is far from essential, but we can't imagine that will stop avid Pokémon fans snapping one up regardless; sometimes, the dreams of your youth are enough to totally override common sense. Sounds like the new power glove. So limited in purpose, yet you know you just HAVE to have one. Surprised at the button inputs. Having to push the analog stick to press "A" sounds like a nightmare. Waiting til someone hacks this and beats Dark Souls with it. Why didn't they make the top button the A button and the stick press the B button? Seems more logical that way. Accessories and forced control schemes turn me right off the games that use them (I barely used the Wii). I don't want to walk around with this or be waving a Joycon around. Just want to sit and play a game. I'm quite concerned about the control scheme now with the mention of clicking in the stick to press A, since I have the accessory pre-ordered along with the game. I don't think I'll cancel my pre-order, but I'll give the thing a fair shake first. I think it’s neat, I’m just not crazy about the game it’s attached to. If it works with Gen 8 then I may consider getting one. It's not like I wanted to play this game in the first place. But these gimmicks make the experience worse for me. I'll just wait for Gen 8. @RupeeClock It has me waffling too, but I’m going to still get it. If anything, I’m sure my friend will love to use it on co-op. And I bet I’ll get use out of it for Go. This will be on sale like Starlink in no time. I still don't' understand how it's worth $50. 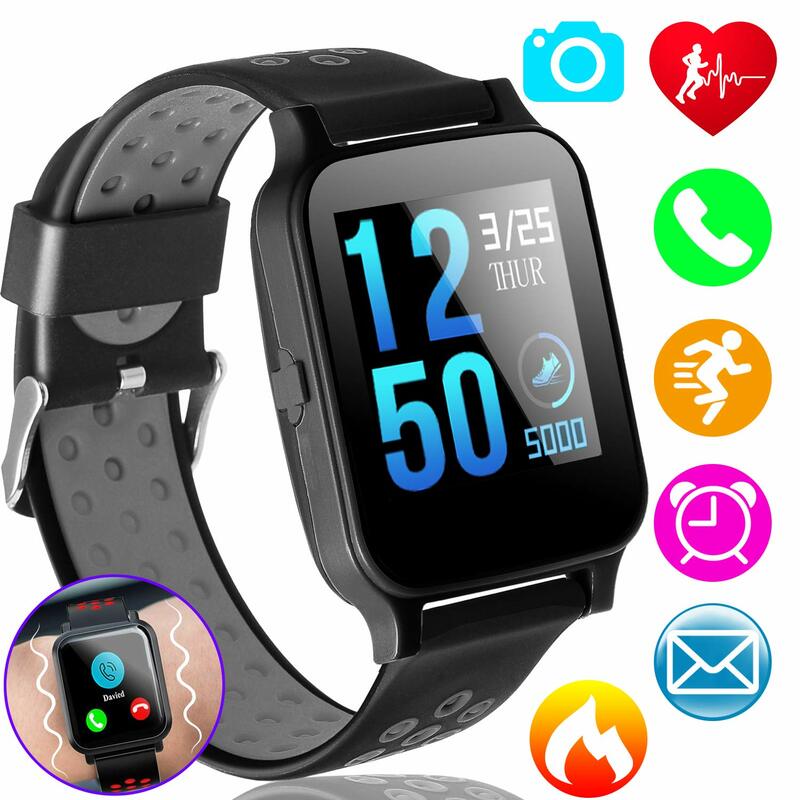 For $35 on Amazon you can buy a smart watch heart monitor calorie counter pulse reader w/ a touchscreen and social media apps that links up to your phone for calls as well. This thing doesn't even have a screen. A single Joycon w/ HD Rumble and an IR sensor on the bottom or an NFC reader and 6 more buttons is only $40 and that can be easily attached to the side of your Switch. There's just no way this has more tech in it than a $40 Joycon. $50 is way too much. Do you get Mew with that? What a waste of money. It would be better spent donating it to charity. "makes you feel like a Trainer" but - does it make me feel like Batman? The Nintendo's politic about the price is just disgusting. This is like the 90$ for a dockstation that is nothing more than a plastic box with no real electronic inside. @dew12333 Mew's worth $1.99 tops. Though he's basically just a free pre-order bonus for a $50 controller. Nintendo really seems to stay away from pre-order bonuses unless they are paid for, like season passes and DLC, I rarely see them do a free pre-order bonus just for pre-ordering a game. Though the piranha plant in SSBU qualifies, registering it on MyNintnedo may be a hassle for some, but free registration is better than a $50 controller so I'm ok with it. Not really worth it though. If you're just going for completion, just trade a Mew with someone, beat the Mew Master Trainer with that and then give him the Mew back. I must say, I pre-ordered Let's Go Pikachu and really didn't even consider picking one of these up. Not having Mew is going to annoy the completionist in me but maybe I'll bully my little sister into thinking this is an essential purchase for her Switch... I mean, I'm not going to be the one to hand over this thing as a Christmas present, but my older brother/parents could be fooled. Sorry, thinking out loud. can i throw it at the pokemon on the screen and not break something, no. Ok that makes the decision super easy! If it wasn’t for the discount from Best Buy Gamers Club Unlocked (bundle), I would have likely skipped on buying it. The part that bugs me is the A button is clicking down the analog and the B button is the top. I can see myself having some accidental confirmations. It should of been the opposite. Then again, maybe I’m over thinking it. If I get this, it will likely be in the bundle. I needed Pro Controller is the best Ergonomics. I don't buy Gimmick controller. Sorry NL, this is not a neat touch. It’s another example of Nintendo insisting we buy endless skip-fulls of plastic that we have no need for whatsoever, in order to unlock content in a premium game. It’s like horse armour, but with the added insult of adding to landfills. Eh. No big deal. I'll probably get one at some point. Definitely nothing to cry about. You either want to buy one or you don't. Like the review states, the better control scheme is already part of the Switch. No score? Embarrassing. Charger, case and ball $80. This could be a Christmas present for a child. Maybe stronger message should be given. I have three coming on Friday, for me and my two sons. @Cobalt Then... don't buy it? I never understood why people complain about things they don't want. And, anyway, it functions as a controller for the game, so it's hardly just a plastic McDonalds toy. ". The force-feedback motor also gives a rumble, which will convince younger players than there really is a wee beast caged within." Wait, force feed-what? I don't understand. Are you saying Mew isn't actually in the Pokeball, and it's all just an elaborate ruse? I've had it with Nintendo, all they have is smoke and mirrors. They told me they were including Mew in the ball and I believed them! Nowhere on the website does it say it's just simulation. They said they included Mew inside! Nintendo and/or TPC halfway-did something? @NEStalgia Get your pitchfork. There's a meeting in town square in an hour. This shall not stand. @HobbitGamer It's just not right. If they're going to tell me that they're selling me cat balls, I'd better receive cat balls for my money! @WiltonRoots and my four year old couldn't be more excited. Not going to lie, I am 32 and I am getting it. I kinda wish I knew that clicking the control stick was how you press A, which sounds awful and now I kinda wish I didn't preorder the bundle, since I don't really want to play the game that way. Oh, well. According to Nintendo more people who pre order the game actually purchase this along with it. It still sounds fun. Getting mine soon. Although it looks great and would be a nifty gadget for €20 or so, the price is stupidly high and the functionality is apparently stupidly bad. What a shame! Also, I don't know why Nintendo gets the honour of being good at immersive peripherals. Sega released Samba de Amigo with its maracas four years before Donkey Konga (and made a game you have to talk to to progress! if that isn't immersive...). I suppose the honour is based instead on popularity, but how many people have even played either of these? @frogopus I can imagine, I bet your lil one can't wait! Does one Poke Ball unlock Mews for all local users? Or does it only unlock one Mew for one user? To each their own, but I think this thing is a waste of money. I love Pokemon, but I can't justify it for 50 bucks, even with a Mew. You don't understand my point. But I think about all the parents during the Chrismas period. They're gonna be scammed manner of speaking. I don't like that attitude at all. If you think that 50$ is a normal price for that thingy, ok I respect your vision but for me, this is pure robbery. @Anti-Matter Yes, the ball can hold one Pokemon (same as in the games), so it comes with Mew already caught. It's not a pre-order bonus DLC kind of thing, Mew's just stored in the ball at purchase. @Cobalt How is it a scam? The controller works, unlocks Mew, and seems to be fairly well-designed for what it is. You not liking the concept or thinking it's overpriced doesn't make it a "scam." I'm not interested, but I don't see the need to be down on something others are looking forward to and that seems to be working as advertised. People only usually go out of their way to attack something if they're preoccupied with it for whatever reason. There's no reason to feel ashamed if you secretly want to buy it so that you can feel like a Pokemon trainer. @Ralizah @Cobalt They're not going to be scammed at Christmas... I don't even understand that view. A Barbie dollhouse is $180. And that just sits there. A pokeball case for your pokeball controller? Awesome! However, at $50 and since I don't play Pokemon Go, I can't personally justify the price. $25-$30, sure, but no one's going sell it at that price. I hope it helps those who play Pokemon Go. Seems to be aimed at the more money than sense Amiibo crowd. @Franklin Gasp! That’s me alright! @Jokerwolf : I'm 38 and I'm getting it for myself. And all of the wonderful gimmicky accessories that were plopping out like crazy on the Wii, are now coming into play on the Switch (labo cardboard, fishing rod, cabela gun, this poke ball, racing wheels and more). Other than that, it looks like a neat accessory for fans of the Pokemon series, but it's also expensive...and sorry, NL, Amiibo's weren't something that nintendo created...Skylanders, Infinity were around first, and even before that, there were other things like it around. Back to the article, looks a little too small and uncomfortable, and I'm thinking that they should have made one that's at least the size that shows the characters throwing one. And the price is pretty expensive too. And, I guess this game won't be a buy for me or my kids, as we'd rather have a game that doesn't involve you looking like a monkey by swinging controllers around at home, let alone on the go. @SOUL- well, you could super glue some batwings onto it and chuck it at at some jackass or another while saying "I'm Zubat Man!" The issue with the analog stick button is a deal breaker for me, not to mention the other issues (and I don't play "Pokémon Go," so that functionality is useless to me). They should've made it a circle pad button instead. I'll stick with the Joycons. @AlphaElite That would be even worse, as it's much more intuitive to use your thumb for the accept button. Players would keep accidentally cancelling out of menus or accidentally making the opposite choice as they intended if they switched the functionality of the two buttons. @rjejr It has the Pokémon name attached to it and then they think they can charge whatever they want for it. Then on top they lock Mew behind it, to force people to pay up if they want this Pokémon. I don't like it one bit where Nintendo is heading.....I guess it won't be long now until we see the first gamble....ehh loot boxes appear within Nintendo games. I just cancelled my pre-order. Now I'll get the Smash Pro controller instead. @WaffleKnight yep I hate setting clicking of thumbsticks being a major button used in the game. Some games like Splatoon 2 use it well where it is used for special weapons you don't use constantly. but when I was trying Rainbow six siege at a friend's house, it used them to angle the player when aiming, and I really didn't like it. I ended up remapping my friend's Xbox One Elite controller(which I was using), to use the back triggers for thumbstick clicks, just to make it bearable. My kids collect Pokemon cards, they probably each have other 1,000. Nintneod practically invented "loot boxes". Once each Pokemon card has an NFC chip installed for a Switch game it will be raining loot boxes. It's amazing they haven't done it yet with a game like Pokemon Snap: amiibo Edition. But I can't imagine it doesn't happen at some point. @TheGhostWhoWalks That's a slippery slope, really any money spent on recreation could be better spent on charity. Can you use it to play other games? Because this seems like the best possible way to play Ikaruga. @Cobalt even though I agree with some of your points and not with others, what's that about the dock you said and I quote: "...with no real electronic inside". Believe me I also think it's overpriced but what is that supposed to mean xD I find it very funny. I pre-ordered the game and pokeball combo, and I'm not disappointed. Yes it might be higher priced than some other accessories, but I like the tactile and aural synchronization when you capture a Pokemon. I am, by no means, a newbie to this game, having played from Blue and Red up to X and Y. While I don't envision myself as a real trainer by using the Pokeball Plus, I do enjoy the added dimension of gameplay. To me, that makes it worth it. @NOELQUEZON I checked, the Pro Controller won't even connect while Pokémon Let's Go is running.